Lee Siegel op-ed: Blaming personal finance victims for their moral failings is easy. They’re not the problem. Yes, some people are irresponsible jerks. But they’re not the real problem. Let’s agree Siegel comes off in the piece as a bit of a jerk. (I mean, did he have to insult people who sell shoes for a living?) But does it matter? No. Siegel is clearly entitled, has an abrasive personality, and almost certainly didn’t need all those degrees, but that has little to do with the merits of his case. (Though if you’re going to default, do it with a group that can help you challenge your creditors, such as the Debt Collective, so you have a chance of not wrecking your credit record in the process.) And he’s right about the bigger point: It’s unconscionable that we encourage our young people to sign up for debt servitude many are too young or too ill-informed to understand so they can receive an education, and then judge them failures when they can’t keep up. Yet separating those who deserve aid from those who deserve their dire financial fate is a chronic issue in personal finance, not to mention American life. When we look to see how people went wrong—and when we attribute individual finance woes to failures of character—we don’t look to broader societal problems. We turn to their personal habits and less-than-winning traits. Debt? Not enough savings? David Bach, the author of best-sellers like Smart Women Finish Rich and The Automatic Millionaire, tells you to cut back on small indulgences, like Starbucks. It’s not that your salary hasn’t kept up. Instead, he’s one of the many personal finance pundits who claim it’s our luxury spending that’s doing us in. All too often you’ll hear someone rant about people on food stamps who dine on lobster or filet mignon or who invest in smartphones when they should make do with flip phones instead. Then there’s the blustery, wildly successful radio personality Dave Ramsey. Let’s give Ramsey his due for a moment—he all but begs people not to take on student loans. But his advice on how not to do that is all but laughable. “You can pay your own way,” he wrote in a 2012 blog post. His suggestions for doing that? Get a part-time job and make sure to buy used textbooks. Those suggestions are laughable, considering college costs have increased by more than 500 percent over the past two decades. As for bankruptcy? Ramsey doesn’t believe in it, even though—get this—he once declared bankruptcy. If you are in debt, you should live on “beans and rice” so you can get out of it, he tells his audience. But it’s not just gurus. We see this, too, in Money Makeovers, the forever popular newspaper feature (in which I got my start writing about personal finance almost two decades ago). A few months ago, a Makeover in the Los Angeles Times profiled a middle-aged trucker with three teenage daughters in deep financial trouble. The problem? The firms he drove for classified him as an independent contractor, forcing him to lease his own truck and pay expenses. He blew through $30,000 in savings, fell behind on his taxes, and, at the time the piece was published, was almost $25,000 in debt. The trucker’s response? He took to the picket lines. The response of the planner the Los Angeles Times brought in to fix his finances? Look for a new job, though how exactly he was to do this was not offered. And activism? That’s for people without children. One reader had this response: If you couldn’t afford them, why did you have children at all? We want to believe that in our society any problem can be overcome with a bit of gumption and work. Unfortunately, that isn’t always so, no matter how many accomplished writers take to Twitter to proclaim their willingness to pay their bills. 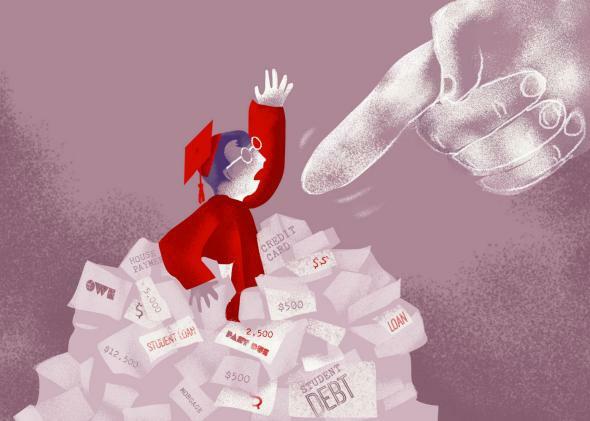 There is, unfortunately, no question that the more than $1.1 trillion in outstanding student debt is having a dreadful impact on at least some of the people taking it on. Almost no one ripping into Siegel this week is discussing the incontrovertible fact that borrowing money for college might well be better than not going to college at all, but that’s really the best that can be said for it. According to the New York Federal Reserve, people without student loans are more likely than those with loans to be paying the mortgage on homes they own by the time they are 30. And, at least in New York City, people who have student loans are more likely to fall behind on their loan payments than people who owe money on credit cards, mortgages, and car loans. And although Siegel apparently did succeed in finding a woman to take him and his shattered credit record on, that might just be because he’s a guy. According to a paper published in the journal Demography last year by Fenaba Addo of the University of Wisconsin–Madison, women with education debt are more likely to delay marriage than women without debt or men. All too often in our society we confuse financial luck with virtue. As a result, we’re always seeking fully blameless victims. But they are few and far between. Most of us have some culpability in our own financial woes. Moreover, everyone is going to judge by a different standard. Some will say any debt for education is wrong; others will say it’s fine as long as you attend a public university, but woe to you if you try to advance your education at a private one. As a result, when we emphasize that piece of the financial puzzle, we can get lost in the details and left blind to the greater economic injustice of our times. Think of it this way: Even overprivileged writers living in suburban New Jersey deserve a financial break.